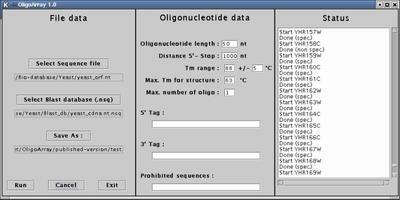 OligoArray is a program that computes gene specific oligonucleotides that are free of secondary structure for genome-scale oligonucleotide microarray construction. Selection is based on three major criteria: oligonucleotide melting temperature, specificity to a single target, or at least to the shortest list of possible targets and the inability to fold to form a stable secondary structure at the hybridization temperature. Here, I describe how Tm, specificity and secondary structure are computed.